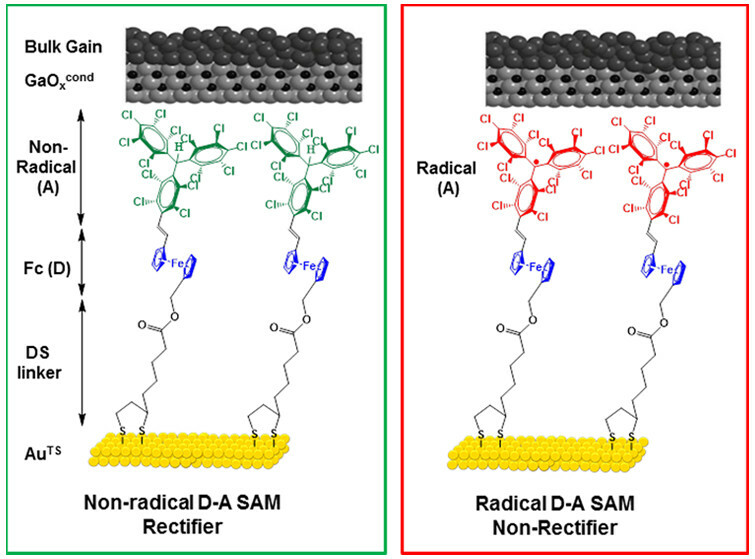 This Communication describes the mechanism of charge transport across self-assembled monolayers (SAMs) of two donor−acceptor systems consisting of a polychlorotriphenylmethyl (PTM) electron-acceptor moiety linked to an electron-donor ferrocene (Fc) unit supported by ultraflat template-stripped Au and contacted by a eutectic alloy of gallium and indium top contacts. The electronic and supramolecular structures of these SAMs were well characterized. The PTM unit can be switched between the nonradical and radical forms, which influences the rectification behavior of the junction. Junctions with nonradical units rectify currents via the highest occupied molecular orbital (HOMO) with a rectification ratio R = 99, but junctions with radical units have a new accessible state, a single-unoccupied molecular orbital (SUMO), which turns rectification off and drops R to 6..